Interesting news for the Melzo-Duisburg rail service: starting from Wednesday November 2nd, it will become an open access service, managed by Hannibal, Contship multimodal transport operator, in partnership with the Dutch companies Samskip and Shuttlewise. The three operators choose to pool their know-how and knowledge of the respective markets, to provide clients with more integrated and effective solutions. 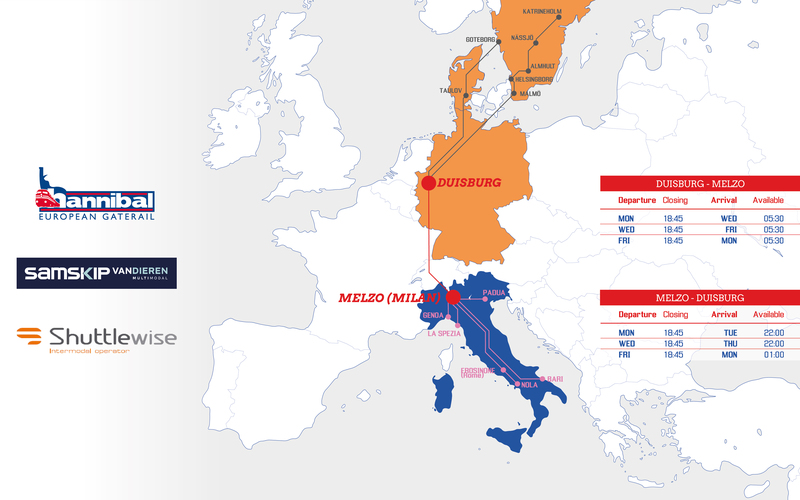 The partnership will enable an improved leverage on the connectivity of the two hubs, linking their network to provide clients with the opportunity to use the longest North-South European intermodal corridor, connecting the intermodal centers of Southern Italy (Frosinone, Nola, Bari) and the Northern European and Scandinavian hubs (Taulov, Helsingborg, Malmö, Göteborg, Almhült, Nässjö, Katrineholm) travelling along the Melzo-Duisburg axis, with the possibility of loading semi-trailers with a P386 (Gotthard lane), dangerous goods and waste materials; furthermore, there is the possibility of connecting Italy with Silkroad Trains to/from China and a daily link to Hamburg Billwerder terminal. Besides the connections with Southern Italy hubs, Hannibal will have the opportunity to enhance the scope of the range of intermodal links between RHM – Rail Hub Milano, and the main Italian ports, the so called “Southern Gateway” option, together with the continental trade offer. From RHM hub in Milan – Melzo, there are three weekly departures scheduled (on Mondays, Wednesdays and Fridays, closing time at 18.45) and three arrivals (always on Mondays, Wednesdays and Fridays, arriving at 5:30 am). These are the connections available from Duisburg to Sweden and Denmark. The project foresees a further development, which should increase the frequency of the service to 5 pairs of trains per week in 2017. Follow the link to explore Contship intermodal services network and learn more about available connections.